The death of Julius Caesar ushered in a period of anarchy and civil war in Rome. In order to restore peace, the Second Triumvirate was established which divided the Roman Empire among Octavian, Caesar’s great-nephew, Marcus Lepidus, and Marc Antony for 5 years. Octavian (later known as the emperor Augustus) controlled Rome and Gaul; Marcus Lepidus ruled over northern Africa; and Marc Antony took over the Empire’s eastern provinces. In 42 BC, Marc Antony obtained victory over Caesar’s assassins at the Battle of Philippi. He then set his eyes on conquering Persia, but first needed to discover if Cleopatra, who had remained neutral during Rome’s unbalance, was an enemy or ally. She accepted an invitation to meet him at Tarsus, and in true Cleopatra style, arrived on a barge with purple sails and silver oars. Her maids sailed the ship dressed as sea nymphs while Cleopatra, dressed as Aphrodite, lay under a golden canopy fanned by boys in Cupid costumes. Marc Antony was clearly impressed. Both had much to gain from an alliance. Marc Antony needed Cleopatra’s money and she needed his help in establishing an Egyptian Empire. Whatever the original intentions were, the two leaders quickly fell in love. Marc Antony postponed his plans for Persia and left his responsibilities behind so he could return to Alexandria with the queen. He would end up spending the winter there. In 40 BC, Cleopatra gave birth to twins, Cleopatra Selene and Alexander Helios. Their time together as a family was cut short later that year when Marc Antony returned to Rome to negotiate a settlement with Octavian. A deal was made stating that after the Second Triumvirate ended, Octavian would rule over all of western Europe and Marc Antony would continue governing the eastern end of the Empire. To seal the arrangement, Marc Antony gave up his love in Egypt and wed Octavian’s sister, Octavia. Three years later, he abandoned Octavia and their daughters and returned to Egypt to marry Cleopatra and resume his campaign on Persia. Cleopatra gladly married him, but only agreed to finance his battles after he promised to have her sister Arsinoe executed. Octavia remained loyal to her bigamous husband despite his constant insults. Once, she decided to pay him a visit in Alexandria, but when she reached Athens, she received a note saying he would meet her there. Cleopatra, jealous and determined to keep her husband from his other wife, threw a tantrum where she cried, fainted, and starved herself. The ploy worked; Marc Antony cancelled the trip. Upon hearing the news that his sister had once again been made a fool, a seething Octavian vowed revenge on the lovers. In 36 BC, Cleopatra gave birth to Marc Antony’s second son, Ptolemy Philadelphus. The two rulers were becoming increasingly arrogant, claiming to be a new version of the gods Isis and Dionysus. In 34 BC, Marc Antony doled out the Donations of Alexandria. He named Alexander Helios king of Armenia, Cleopatra Selene queen of Cyrenaica and Crete, and Ptolemy Philadelphus king of Syria. Caesarian was proclaimed “King of Kings” and Cleopatra “Queen of Kings.” A few years later Marc Antony divorced Octavia, forcing the western portion of the Empire to recognize his marriage to Cleopatra. The two were prepared to fight for sole control of the Roman Empire. The Roman Senate officially declared war and in 31 BC, Octavian and Marc Antony fought at sea during the Battle of Actium. Cleopatra was present with 60 of her own ships, but after forseeing the nimbler Roman ships would overcome, she and her fleet fled. Marc Antony ran out on his men mid-battle to follow his wife, further cementing in the minds of the Roman people that he was enslaved by his love for the foreign queen. The pair hurried back to Egypt with Octavian in pursuit. Upon her return, Cleopatra ordered her workers to build a mausoleum and move her treasures into it. She locked herself inside and sent servants to spread word that she was dead. Hearing this, a distraught Marc Antony threw himself onto his sword, but did not die right away. Slowly nearing death, he discovered that she was, in fact, alive. Per his request, he was hoisted through on of the mausoleum windows and spent his final moments cradled in the arms of his consort. His last wish before passing on was for Cleopatra to make peace with Octavian. Cleopatra was still living in the mausoleum when Octavian’s forces arrived in 30 BC. She refused to come out of her safe-house and threatened to set fire to her valuables if forced out. Undaunted, Octavian ordered the mausoleum to be used as a holding cell, then placed guards to watch over his prisioner and make certain any suicide attempts were unsuccessful. Negotiations between Cleopatra and Octavian fell through, primarily because Octavian wanted the mighty Cleopatra for a slave and her treasures for himself. 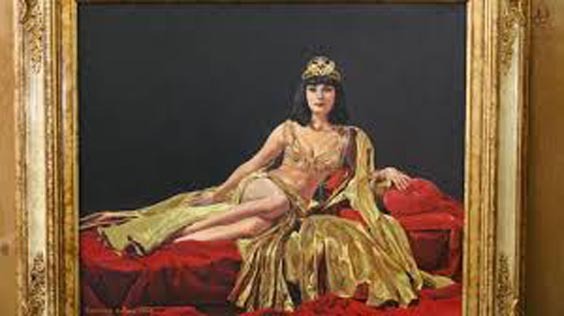 Determined not to be put on display and humiliated as Arsinoe had, Cleopatra dressed in full regal attire, laid down on a bed of gold and allowed an asp (which had been smuggled in) to mortally bite her. The two faithful servants that had been by her side throughout the ordeal welcomed the same fate. As per their wishes, Cleopatra and Marc Antony were buried together to spend eternity. Afraid that Caesarian may someday use his legacy as Ceasar’s son to start a rebellion, Octavian ordered the boy’s tutor to strangle him. The 3 children born to Cleopatra and Marc Antony were sent to Rome to be raised by Octavia. The deaths of the great Egyptian queen and her eldest son marked the end of Egyptian rule. The power now belonged to Rome, and Cleopatra’s nightmare became a reality as the once soveriegn nation became yet another of the Empire’s provinces.